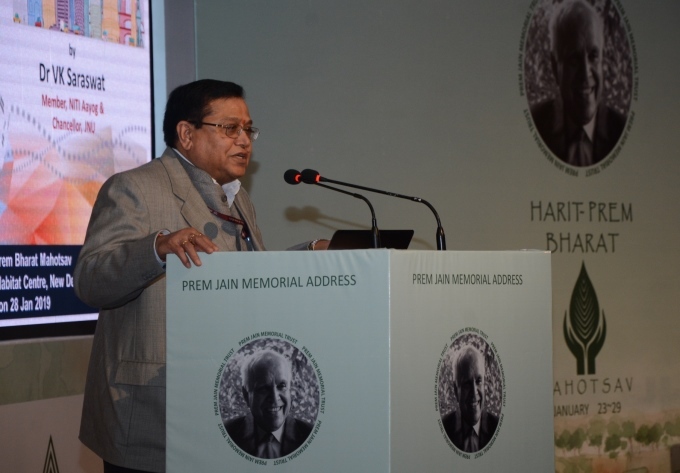 Prem Jain Memorial Trust organised week long celebrations titled Harit-Prem Bharat Mahotsav from January 23 to 29, 2019. A Memorial Address on 28 January 2019 at India Habitat Center (Delhi) was also part of the celebrations. The Chief Guest of the occasion was Padma Shri and Padma Bhushan Dr. V. K. Saraswat, presently member of NITI Aayog and Chancellor, JNU. Padma Shri Architect G. Shankar also graced the occasion. Dr. Prem C Jain is known to be the key architect of the modern green building movement in India. He ushered in a paradigm shift in the way buildings are conceived and designed worldwide. He worked to facilitate India’s tall stand in the global green building movement and always aspired for “Bharat to emerge as jagat guru in Sustainable Built Environment”. Harit-Prem Bharat Mahotsav was supported by the Indian Green Building Council (IGBC), Indian Society of Heating, Refrigeration and Air-conditioning Engineers (ISHRAE), American Society of Heating, Refrigeration and Air-conditioning Engineers (ASHRAE), Indian Plumbing Association (IPA), Defense, Infrastructure Planning and Management Council of India (DIPM), Fire Security Association of India (FSAI), and institutions like School of Planning and Architecture (SPA), Gateway University, Amity College and Apeejay College through their pan-India networks. As part of the week long celebrations, these affiliated societies and institutions undertook various activities across the country which included organising lecture series, essay writing and painting competitions for students and plantation drives. Dr. Prem Jain graduated from Banaras Hindu University in 1957 and obtained double Ph.D in Mechanical and Electrical Engineering, from University of Minnesota, USA in 1965. With an idea to build a consultancy firm, which would continue after him, he created SPECTRAL in 1980, making it a premiere consulting firm in MEP design over the next 3 decades. Through his career, he designed services for Vigyan Bhawan, AIIMS, Bahai Temple Extension, Siddhi Vinayak Temple, Osho Ashram Pune, and several iconic projects. Since SPECTRAL had designed energy efficient buildings for three decades, Dr. Jain was invited to design the first Green Business Centre in Hyderabad. Indian Green Building Council (IGBC) was founded and the SPECTRAL team designed Godrej Green Business Centre, which got the highest LEED Platinum Rating from USGBC in 2003, and became world’s Greenest Building in March 2004. In 2011, Spectral merged with the world’s largest consulting firm AECOM and Dr. Jain took over as Chairman Emeritus for AECOM India, with 1 lakh engineers and architects in 150 countries. Dr. Jain became the Chairman of Indian Green Building Council (IGBC) in 2007, driving awareness in India about a Greener way of life. His dream was to make India a world leader in ‘Green’. Dr. Prem Jain is revered by many in India as the “Father of Green Buildings”. As of November 2018, over 4,900 projects, amounting to over 6.4 billion sq.ft of green are adopting IGBC standards. Here’s hoping the Prem Jain Memorial Trust is able to live up to the expectations and worthiness of man that ushered in the very concept of Green Building in India.